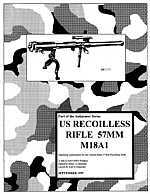 Operating, maintenance and training instructions for the first U.S.Army Recoilless Rifle and accessories. 4. Also Note: We sell large number of photocopies of military manuals and articles on Antiarmor warfare.